When using variable substitution to evaluate a definite integral, you can save yourself some trouble at the end of the problem. Specifically, you can leave the solution in terms of u by changing the limits of integration. 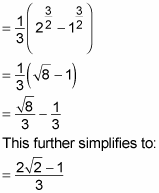 Notice that this example gives the limits of integration as x = 0 and x = 1. This is just a notational change to remind you that the limits of integration are values of x. This fact becomes important later in the problem.